Our Cooper 2 seater sofa in Blue fabric boasts a sleek and simple shape, perfect for modern living rooms. 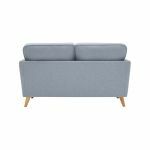 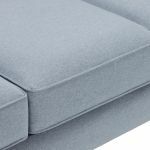 Inspired by Scandinavian design, it has clean and elegant details, including the plain-fronted piped seats, and slim arms. 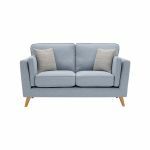 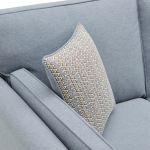 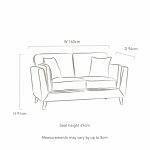 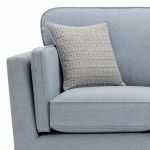 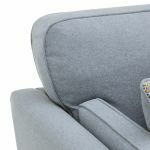 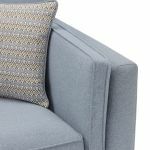 The seats feature our exclusive and cosy dual foam interior for easy maintenance and great shape retention, and the small sofa comes with complementary scatter cushions with a subtle pattern. 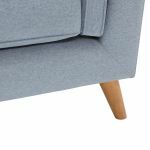 The light and airy look is completed by the slim turned oak legs which elevate this living room staple. 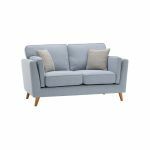 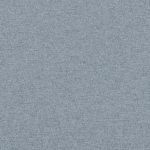 Browse our other great Cooper colours and styles today, with free delivery as standard.